The eighth grade algebra class is equivalent to Brother Rice High School’s Freshman Honors Algebra I class. This course is designed to convey an understanding of the meaning and use of variables, formulas, equations and inequalities, exponents, functions, and graphs. The significance of word problems and of strategic problem solving is emphasized throughout the course. Our program aims to provide the necessary knowledge base and skills in order to realize the full advantage of every college level mathematics course offered on the high school level. Tuition for the complete program including the purchase of a Chromebook and online textbook is $600.00. A deposit (purchase price of the Chromebook) is due by May 1, 2019. The remaining balance is due at the parent and student orientation meeting in August. The class meets 7:00-7:45 a.m. Monday – Friday. The program will follow the Brother Rice High School calendar. Qualifying exam – Wednesday, February 13, 6:30 p.m. or Saturday, February 23, 9:00 a.m.
Only current seventh grade students are eligible to take the exam. Students should bring No. 2 pencils (no calculator). Pre-register for the qualifying exam. 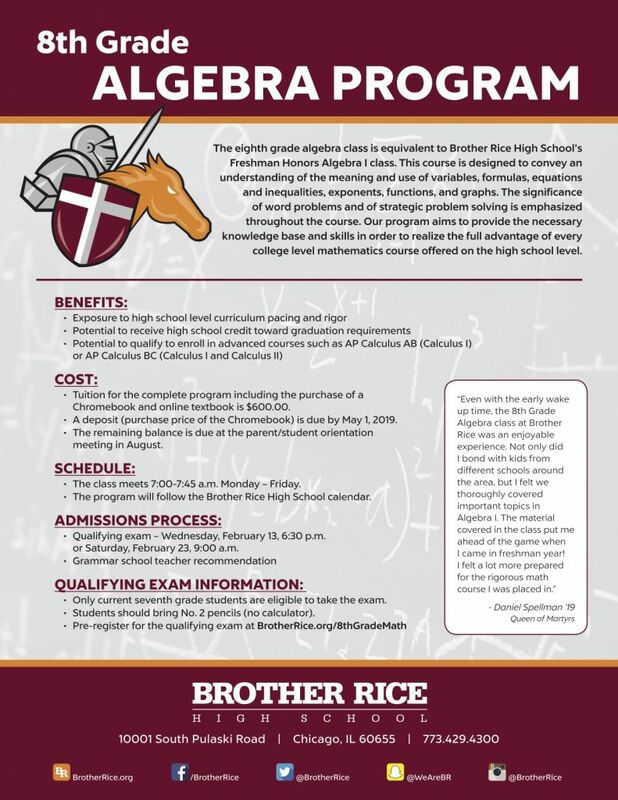 For more information please contact Ms. Kay Scaletta at math8@brrice.org or 773-429-4300 ext. 270. Advanced Placement courses at the high school level follow a college-level syllabus as established by the College Board. This rigorous program provides a challenge and enables a young person to show mastery of college level material. The Advanced Placement examination score is forwarded by the College Board to the student’s college of choice. Credit may be awarded based on the earned scores. Most Advanced Placement courses are offered to juniors and seniors.